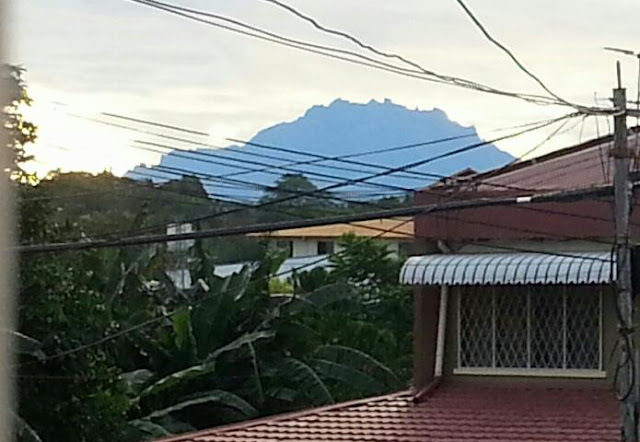 After living in my current house for almost 3 years now, I only came to realise that the view of Mount Kinabalu is clearly visible from our first floor bedrooms. I noticed it when I went to close my girls' bedroom window one fine morning before rushing to work (rain in the afternoon is very frequent here so I have to make sure all windows are closed before leaving the house each morning). Honestly, I always envy those who have houses with nice view of Mt. Kinabalu all this while without realising our house is one of them too..I am so very pleased. Here is the view of Mount Kinabalu taken from our room on a clear sunny morning. I cropped the picture to get a nearer view. Ahh... NICE! Now you are also one of those that ppl envied having a nice view of Mt Kinabalu! Hehe..